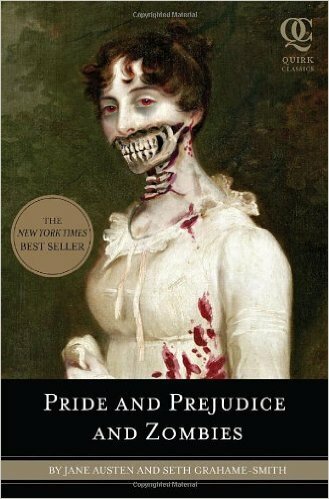 “It is a truth universally acknowledged that a zombie in possession of brains must be in want of more brains.”So begins Pride and Prejudice and Zombies, an expanded edition of the beloved Jane Austen novel featuring all-new scenes of bone-crunching zombie mayhem. As our story opens, a mysterious plague has fallen upon the quiet English village of Meryton—and the dead are returning to life! Feisty heroine Elizabeth Bennet is determined to wipe out the zombie menace, but she’s soon distracted by the arrival of the haughty and arrogant Mr. Darcy. What ensues is a delightful comedy of manners with plenty of civilized sparring between the two young lovers—and even more violent sparring on the blood-soaked battlefield. Can Elizabeth vanquish the spawn of Satan? And overcome the social prejudices of the class-conscious landed gentry? Complete with romance, heartbreak, swordfights, cannibalism, and thousands of rotting corpses, Pride and Prejudice and Zombies transforms a masterpiece of world literature into something you’d actually want to read. One of my absolute favourite parts of this novel was how close to the original Pride and Prejudice it stayed. There were some parts that really pulled me out and jostled my notions about what the Austen characters were like. In adding zombies there was far more violence added, though that did not detract from the story. Elizabeth, having previously been known as a rather quick to anger character, showcased that anger in a new take– in thinking of ways to destroy her enemies, and the people that bothered her. I rather enjoyed that weaker characters did not have any knowledge of the dark arts, and instead of simply questioning their integrity based on their apparent inability to think/act for themselves, Elizabeth could judge them based on their uselessness in an emergency zombie situation.There was one part of the novel that completely irritated me every time I saw it (and it happens in any Pride and Prejudice related writing I read): calling Elizabeth Eliza. While in the original novel Catherine was always Kitty, Elizabeth was referred to as Lizzy only a few times, and only by her family and close friends. The only time Elizabeth was called Eliza was by Caroline Bingley, and it was clearly meant to bother/insult. I absolutely adored what certain characters received in regards to their nasty/horrible nature. I was sad about Charlotte’s ailment, in particular because I would rather have had it happen to Mr. Collins. Mr. Wickham got what he deserved, but I almost wish that Lydia would have grown more from her experiences and the knowledge she would have gained from her adventures. This novel was well written in the same tone that Austen’s novel was in. While Pride and Prejudice has had a top spot in my heart since I was 9, I will say that this book is also quite high on my list of good/favourite books. I absolutely recommend this book. It’s a phenomenal read and you will not be disappointed! Well… unless you don’t like Jane Austen, or zombies, or both… in which case, this probably isn’t the review for you. Seth Grahame-Smith is the “New York Times” bestselling author of “Abraham Lincoln: Vampire Hunter,” “Pride and Prejudice and Zombies,” and “Unholy Night.” In addition to adapting the screenplay for “Abraham Lincoln: Vampire Hunter,” Seth also wrote Tim Burton’s film “Dark Shadows.” He lives in Los Angeles.